Robert Walser incites me to belle-lettristic flights of fancy. Somehow I had never read him and my life before seems poor and empty. In this new collection of his stories, Girlfriends, Ghosts, and Other Stories, translated by Tom Whalen with Nicole Köngeter and Annette Wiesner, everything feels like spring. The author doesn’t just incite me to belle-lettristic flights of fancy, he also incites the same in figures far greater than me. The rigorous W.G. Sebald is quoted beneath the blurb. For him, Walser ‘illumined every page with the most genial light’, he ‘had his feet firmly on the ground and yet was always getting lost in the clouds’. Could it be that the writer of fifteen page sentences resorts to cliché to write of Walser? I keep referring to belle-lettristic flights of fancy because he writes things like this: ‘Now the land became a song and the song intolerably beautiful’ or ‘“Spring has returned” sang through the air, here and everywhere’. Even in his later work (this collection is arranged chronologically, each piece is dated), where, ostensibly, he becomes darker, more anxious, more self-reflective and self-reflexive, he still writes: ‘They’re like people we’re capable of loving because they’re not difficult. I also wish this for what I have written here’ or ‘When she smiles and nothing befalls her, when she reveals herself in her untroubledness, how good Nature then is.’. These sentences are very beautiful. They restore hope in the world and offer that hope as universal beneficence. In contrast to Kafka, for Walser there is an infinite amount of hope and it is for us. And it is told to us through simple, subjective impressions of the world being presented objectively, or, alternatively, as a wish from the author to the reader that we are invited to assent to and cannot but assent to in response to its charm. Each of these quoted sentences finishes a story and generously offers its riches for the world. Robert Walser incites me to belle-lettristic flights of fancy and he knows he’s doing it. There is a story, or a feuilleton, an essay, a sketch, a récit or whatever we call these unclassifiable little works, in this collection, entitled ‘The Belletristic Book’. Here Walser writes, ‘I believe I may advise novelists to be enchanting beyond words and, as far as technique goes, outrageously sophisticated, yet without in the least behaving as if they knew a lot or as if life had dealt harshly with them, both of which create an impression of disingenuousness’. It’s clear that Walser sometimes takes his own advice. When he deals with nature, particularly, this is exactly what we are given. For example in ‘Lake Piece’ we are told ‘this piece is very simple, it’s about a beautiful summer evening and many people who promenaded back and forth along the shore of a lake.’ Here, ‘everything transformed itself into sonorous life and into a sonorous beauty; the world was like kindness itself, and one could no longer find fault with life, with human existence’. There is something to be said for this aspect of Walser’s writing. He enchants a world that, as he was writing, was becoming more and more completely disenchanted, by the First World War, by Taylorist and Fordist techniques, and by the rise of fascism. In Walser’s belles-lettres, then, there is something political, an insistence that the world does not have to be like this, that it can still be good, and beautiful, and full of hope. This seems to me to be an underecognised element of modernism, particularly of the modernist literature written in the German language, which is so often understood and depicted as being a dour, nightmarish prevision of and response to the horrors of Nazism. Yet in Walser, Franz Kafka and Walter Benjamin, a constellation of kindred spirits, the latter two heavily influenced by the former there is always another pole, invested in an enchanted and sometimes almost childlike hope in the world. This politics of the beautiful and enchanted seems to already take Walser away from the bourgeois refinement of belles-lettres, the superficiality of the easily digestible, even as he claims an affinity with it. The issue of what Walser draws attention to as ‘sophisticated technique’ also remains, and this is very far from belles-lettres. His sophistication is modernist through and through. At times this takes the form of the cryptic, aphoristic sentence that demands time and thought to be comprehended and for the text to be worked on in light of it. ‘The Belletristic Book’ ends with a statement quite the opposite of the light enchantment of its titular style: ‘Just like people, sentences seem dependent upon being content with their fate, and fate lies opaque in the womb of time’. In another story, ‘Female Portrait’ Walser states, echoing Nietzsche’s definition of his own aphorisms, that ‘my intention is to dance with words’. Both these statements also draw attention to the process of writing itself, that endless modernist obsession. Almost every single one of these eighty-one texts draws attention to its own writtenness in the most explicit way: ‘I confess that the invention of the story I’m telling here has caused be the greatest difficulties’; ‘I saw you early from the window and now I’m writing to you’. There are too competing tendencies then: the light thought that will enchant the world and the sophisticated, complex, self-reflexive technique that will give birth to it. This pattern repeats itself in each text. For each quotation I cite I could produce many near-identical ones from elsewhere in the collection. However, This is not to Walser’s detriment He is compulsively readable in his repetitions. To do his work justice one must either quote from a single story that can stand in for all or quote the book in its entirety. The part stands in for the whole just as each minute event can possibly transfigure the whole world. As such, Walser offers a combination of enchantment, technique and repetition. Any and every quotidian moment can be enchanted but only insofar as how that is translated into words which are questioned, explored, and played with. This said, there are also four clear categories that the stories fall into, certain moments and ways of using language that Walser obsessively returns to: depictions of nature, landscape or place usually prompted by the narrator’s experience on a walk, portraits of people, games with language (for example in a story called ‘The Nimble and the Lazy’ where Walser experiments with switching around and combining these two terms for two pages) and responses to other books. It is the last of these that are possibly the most interesting and which provide a key to Walser’s work. If his texts are depictions of the attempt to translate sensory impressions into words that offer hope and enchantment, then these responses to books are translations of a text from one form into another, from its own language into the same language. Thus in ‘An ABC In Pictures by Max Liebermann’, Walser takes the pictures of letters, that remain pictures rather letters and translates them into language. It is ‘a book without words; it tells its story in pictures’ and yet it is also a book which is the basis of language, an alphabet. These pictures resist ‘any attempts at comparison’ and yet he charmingly extracts their linguistic nature from within them, ‘Each single picture nuzzles up to a letter, a piece of the ocean to B, a childish laugh to F, crying to U, zest for life to Z, hardship to K’, just as the images themselves, in Walser’s language, slip into experiences that cannot be captured by images. Surely, though, this means they cannot be captured by language either. The words ‘zest for life’ are not zest for life, nor can a picture capture this. Walser is a translator who recognises that language slips away from the thing itself; even your own language, your native tongue, is a failed translation. He advises you to ‘seek out the book for yourself and see where I might have slipped up’. This wistful, melancholy thought perhaps undercuts the hope I was so rapturous about when I began this review. The question remains: how can we reconcile Walser’s invitation to soar with the beauty of the quotidian, rendered precisely in these short pieces, and the inevitable failure of language to capture the reality it invests hope in? There are perhaps two options. One could lament this failure of language and give up hope, or, like Walser, to return to the quest to capture reality in language, expecting next time to get closer, to fly higher, paradoxically to escape into reality caught. Tom Whalen is a novelist, short-story writer, poet, critic, and the co-editor of the Robert Walser issue of the Review of Contemporary Fiction. Nicole Köngeter is a freelance translator and teacher of English and German in southwest Germany. Annette Wiesner’s translations of Robert Walser have appeared in Connecticut Review, Kestrel, and Witness. Tristan Burke writes academically on nineteenth-century novels and has written about literature, cinema and critical theory for 3:AM Magazine, The Manchester Review and the Everyday Analysis Collective. Girlfriends, Ghosts, and Other Stories is published by NYRB Classics. Author and translator bios courtesy of the same. 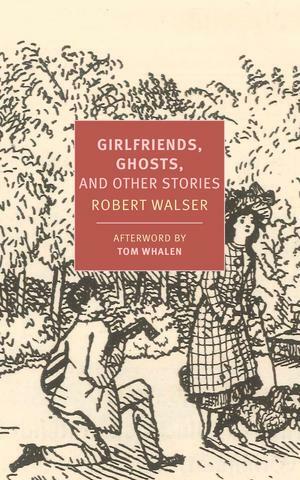 Posted in Book reviews and tagged girlfriends ghosts and other stories, robert walser. Bookmark the permalink.